So far we have been going with the prerequisites to the Machine Learning. We have covered a few of the important concepts that are required to solve Machine Learning problems. If you have missed those post, I recommend you to go through Machine Learning Concepts. Here we will be focusing on Supervised Machine Learning. If you are not sure about various techniques to solve machine learning problem. I recommend you to go through the post Introduction to Machine Learning to get a high level of understanding. is the learning where the value or result that we want to predict is within the training data (labeled data). And the value which is in data that we want to study is known as Target or Dependent Variable or Response Variable. All the other columns in the dataset are known as the Feature or Predictor Variable or Independent Variable. Clarification: Here our target variable consists of the categories. Regression: Here our target variable is continuous and we usually try to find out the line of the curve. Now it's time to understand algorithms that can be used to solve supervised machine learning problem. In this post, we will be using popular scikit-learn package. NOTE: There are few other packages as well like TensorFlow, Keras etc to perform supervised learning. This algorithm is used to solve the classification model problems. K-nearest neighbor or K-NN algorithm basically creates an imaginary boundary to classify the data. When new data points come in, the algorithm will try to predict that to the nearest of the boundary line. Therefore, larger k value means smother curves of separation resulting in less complex models. Whereas, smaller k value tends to overfit the data and resulting in complex models. NOTE: It's very important to have the right k-value when analyzing the dataset to avoid overfitting and underfitting of the dataset. Using the k-nearest neighbor algorithm we fit the historical data (or train the model) and predict the future. The k-nearest neighbor algorithm is imported from the scikit-learn package. Create feature and target variables. Split data into training and test data. Generate a k-NN model using neighbors value. Train or fit the data into the model. We have seen how we can use K-NN algorithm to solve the supervised machine learning problem. But how to measure the accuracy of the model? Here in the example shown above, we are creating a plot to see the k-value for which we have high accuracy. NOTE: This is a technique which is not used industry-wide to choose the correct value of n_neighbors. Instead, we do hyperparameter tuning to choose the value that gives the best performance. We will be covering this in future posts. In this post, we have understood what supervised learning is and what are its categories. 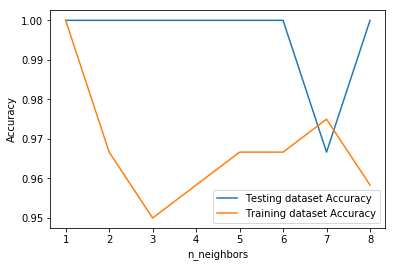 After having a basic understanding of Supervised learning we explored the k-nearest neighbor algorithm which is used to solve supervised machine learning problems. We also explored measuring the accuracy of the model. In upcoming posts, we will be understanding a few more algorithms which are used to solve machine learning problems. Disclaimer- I will be soon publishing this article on Geeksforgeeks.